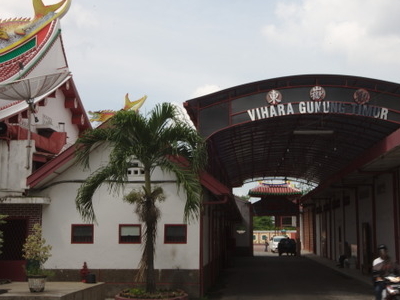 Vihara Gunung Timur (Chinese: 東嶽觀; pinyin: Dōng yuè guān; Pe̍h-ōe-jī: Héng-huá-Bio) is a Chinese Taoism temple which is the largest in the city of Medan, Indonesia and possibly also on the island of Sumatra. This temple was built in the 1962. This temple is located at Jalan Hang Tuah, about 500 meters from the Sri Mariamman Temple and is located on the side of Babura river. It contains a large paved area with an impressively scaled incense burner, two covered badminton courts, a very large main hall and is partly surrounded by a moat and walls. This temple already served as main temple in Medan for many years and it was also one of Medan's cultural icon. This temple always be filled with worshippers in Imlek and Cap Go Meh festival. 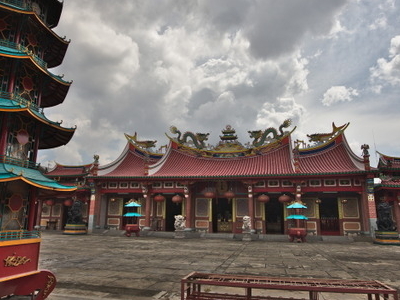 Here's the our members favorite photos of "Temples in Medan". Upload your photo of Vihara Gunung Timur!